If you love hummus, than you probably are familiar with tahini, the sesame paste that is usually added to hummus. 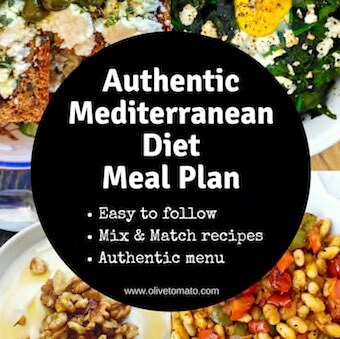 And although hummus is not Greek, tahini plays an important role in Greek cuisine, especially during the fasting periods before Christmas and Easter. 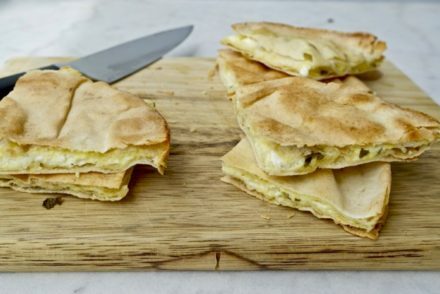 You will find Greek tahini recipes for cookies, cakes, savory pies and fritters. 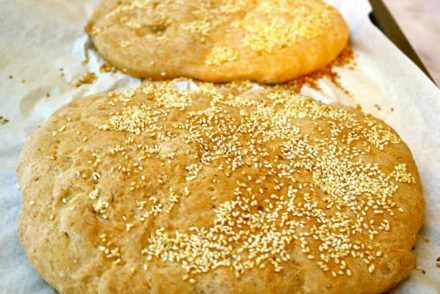 Today, many Greeks eat tahini in the morning on some bread with a bit of honey. 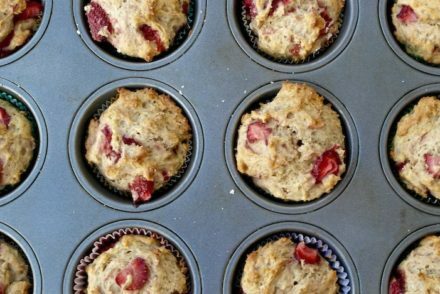 I prefer savory breakfasts for the most part, not only are they filling, I avoid those blood sugar ups and downs you get with sweet breakfasts. Inspired by the latest craze of avocado toasts, I thought: well why not a tahini toast? 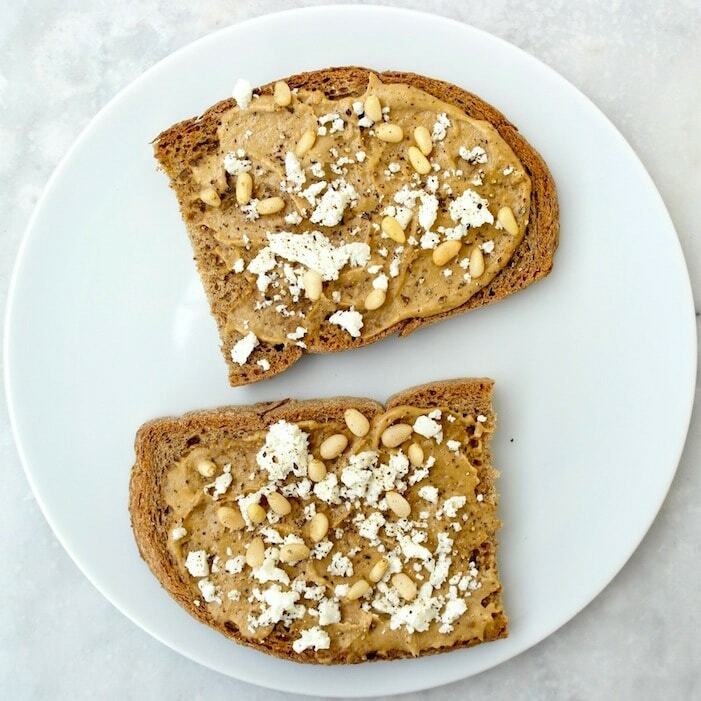 So here is a quick, easy and savory recipe that you can actually have any time of the day: Tahini-Feta Toast. Tahini is a great source of protein, but also vitamin E and a good source of iron, calcium and copper. It also contains lignans a group of substances that have antioxidant activity. As it is a seed butter, it is mostly fat, but the fat is the good fat mostly monounsaturated and polyunsaturated. Spreading this dip on whole grain bread along with a pine nuts and a bit of feta and you have a vey filling breakfast; rich in protein, good fats and fiber. And it is so good. In a small bowl mix the tahini with the water and lemon juice, the consistency should not be too thick (thinner than peanut butter). It should be easy to spread. If need add a bit more water. 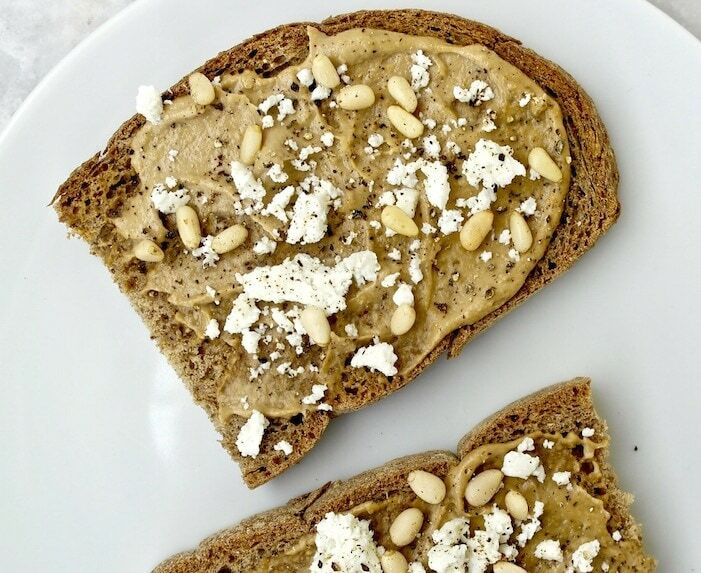 Remove bread from toaster, spread a thick layer of the tahini dip, sprinkle with feta and pine nuts. Hi! Would these two slices be a serving for 2 people? Or calorically, is this fine for one? What do you do? Hi Jayme, It depends on your caloric needs as well as what works for you. I tend to have more carbs during the day, so I may have this as a mid-morning snack. But one slice for a quick breakfast is quite filling on most days.